We have a range of fixtures suitable for use in performance, whether live music or dramatic, which also works well for adding interest to a presentation, product launch, award ceremony or fashion show. Fixtures are either static or intelligently controllable, (although a working knowledge of DMX will be required to get the best from these). If this seems too complicated but you still want a stunning lightshow for your concert or production, please contact us as we can provide a full concert or stage lighting service. This package is suitable for a small band, stage production or presentation on a medium sized stage. Supplied as two easy to erect tripod based bars, each contains 4 spots of 7 x 3W trileds which can create a huge range of colours. Basic changes of colour, sound to light activation or stage blackout is possible via the band members on stage using the supplied foot controller. 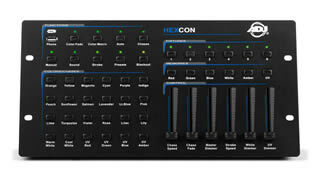 Full control of the individual heads, colour mixing, fading, dimming and chase programming is possible if connected to a DMX controller. Requires 1 x 13 amp socket. 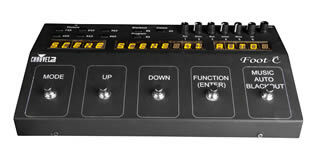 Simple 3 channel DMX Controller allowing you to colour mix and fade all heads simultaneously in the same colour. 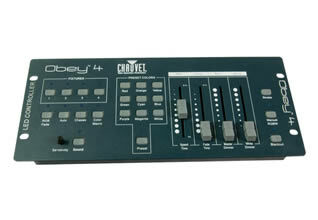 Slightly more sophisticated 4 channel controller, allowing RGBW/A mixing and also multiple fixtures, so you can control each lighting stand separately. Full DMX controller enabling access to the features of each head individually. Similar to the package above it is suitable for lighting a small band, choir, stage production or presentation on a medium sized stage. This however includes the current state of art COB LED lights which are brighter (by about 40%) and create even smoother and richer colours in a wider colour gamut. Supplied as two easy to erect tripod based bars, each contains 4 spots of 30W capable of a virtually limitless colour palette. Basic changes of colour, sound to light activation or stage blackout is possible via the band members on stage using the supplied foot controller or via the supplied wireless infra-red remote. Full control of the individual heads, colour mixing, fading, dimming and chase programming is possible if connected to a DMX controller (requires DMX knowledge). Requires 1 x 13 amp socket. 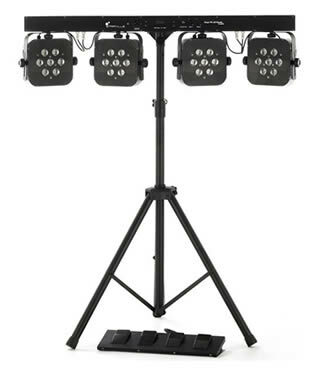 This package contains four 108watt RGBW moving head beam/wash fixtures on two heavy duty wind-up stands. These produce very bright beams, suitable for a medium sized stage and can be controlled and programmed using the included DMX controller. This does, however, require a degree of DMX knowledge to be able to get the most from these exciting lights. Requires 1 x 13 amp socket. Wireless UC3 Controller and two receivers allowing you significantly less overall control of the fixtures but access to the inbuilt programming, but without the need for long runs of DMX control cable. This is a small low-profile fixture using 3 x 5w Quad 4-in-1 LEDs allowing for excellent RGBA colour mixing, particularly able to create convincing yellow and orange colours, whilst remaining surprisingly bright. Ideal for use as a truss warmer or in situations where space is at a premium. 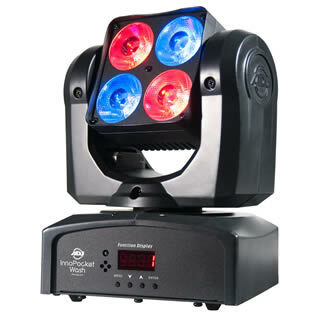 Excellent light output and great RGB colour mixing, make the Flat Par Tri 7 an ideal stage parcan. 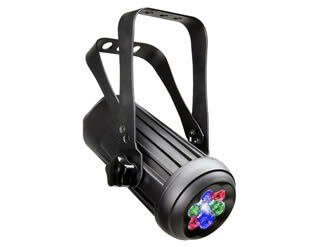 These lights sport 7 x 3 watt tri LEDS, which when used in multiples are capable of illuminating small to medium stages. They can be controlled by an optional remote but also have full DMX capabilities. 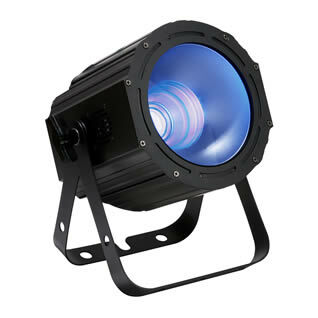 A versatile and very bright LED par fixture with a 30° beam angle and 12 x 12w Hex LEDs allowing you to select a very wide range of colours including pastels, ambers, warm and cool whites and high impact UV, making it a perfect stage wash light for medium to larger stages or uplighting very large areas. It is fully controllable via DMX or an optional remote if required. Flicker free so ideal for TV and film production and has 5 selectable inbuilt theatrical dimmer curves. 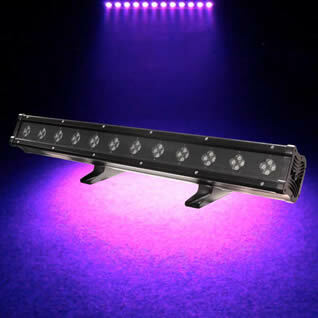 A versatile LED Linear fixture with 12 x 10-Watt , 6-in-1 HEX LEDs creating a 40-degree beam angle, it produces wide washes with smooth colour mixing from 63 built-in colour macros utilizing red, green, blue, amber, white and UV LEDs. Great for lighting stages and dance floors, as well as lighting Cycs and backdrops. It’s features include: 5 DMX modes (6, 7, 8, 12, & 36 channel), 6 operational modes, 5 dimming curves, flicker free operation and magnetic “Quick Align” end locking allows for a seamless output of light with no breaks of colour. 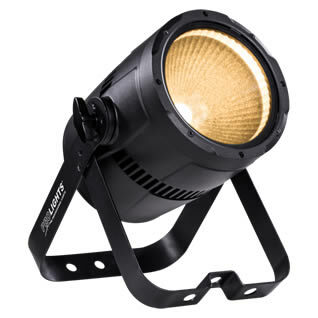 This excellent fixture employs a 150W COB CREE LED RGB source, combined with a special parabolic reflector built in aluminium which develops an extremely bright and homogeneous 60° output, with a perfect colour mixing even in short-range applications. Developed for professional venues by offering an excellent smooth dimming curve, even at the lower end which is so often problematic in LED fixtures, and is flicker free for video use. Perfect for theatrical performances, presentations or conferences. This is the Warm White version of the above, but featuring a 100W COB CREE LED with 3200K° colour temperature. Otherwise it features the same excellent professional facilities and is totally suitable for lighting stages and sets in a natural light. A compact, robust and easy to use general purpose stage lighting fixture ideal for small stages, schools, presentations and display lighting applications. These fresnels provide a superb soft light output and benefit from temperature controlled fan cooling for whisper quiet operation. The 4 push button display allows users to select DMX and manual dimming modes along with dimming curves allowing operation without a dimmer pack. Ideal for temporary set up on in venues where power draw from conventionally lamped units is an issue. Supplied with barn doors and gel frame. A powerful 150W quad-colour COB LED (RGBW) allows this Cyclorama wash the ability to deliver rich, even tones across large areas, ideal for lighting stage or studio backdrops, whilst ensuring perfect colour mixing without any multi-coloured shadows. Via DMX or in standalone mode, it offers RGBW colour mixing, LEE compatible colours, 32 colour macros and a linear variable white colour temperature preset (7200K-3200K). For even more flexibility the CYC 500 has 16 bit dimming, four dimming curves with two dimming speeds, a 90° x 113° beam angle and is convection cooled for silent operation. An eight leaf barndoor with integral gel frame is also supplied, allowing for full colour coverage. A self-contained lighting unit with 4 heads and in-built controller which comes with it’s own tripod stand and easy to operate footswitch. 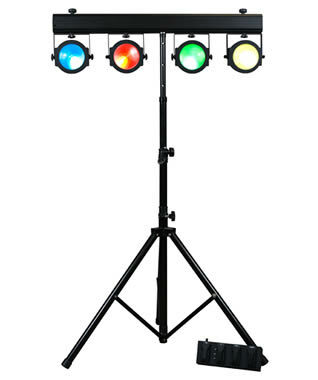 Ideal for lighting performers or karaoke singers. Set up is so straightforward that it can be set up in just a few minutes. See video for an example of it being set-up and in action. 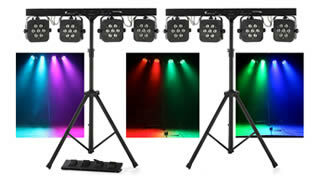 This all-in-one LED Wash system for mobile entertainers, bands and stage lighting features a 4-head T-Bar light system each with one bright 30-Watt COB TRI LED (RGB), producing wide, saturated colour washes of light with LEDs covering a very large area with its 90-degree beam angle. You can also change the light output to a 25-degree beam with the included lens kit. The system is easy to set-up and take down and includes a tripod stand, a foot controller and an RF remote control. 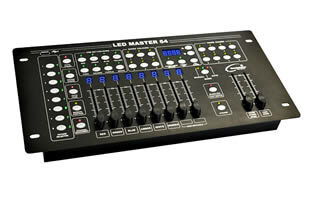 It may also be controlled by an external DMX Controller via it’s XLR In/Outs. User can also mount two smaller lighting fixtures such as strobes, lasers or UV blocks, on top of the T-bar and plug them in directly on the back of the bar. 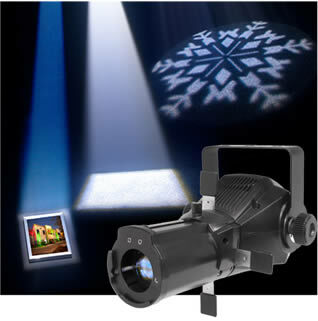 An ideal fixture for use illuminating fronts of stages, both internal and external. These 1m bars contain 48 3w RGBW LEDs giving really high power along with a virtually limitless colour palette, which can be set on-board each fixture in master and slave or via DMX. Due to their IP65 rating, these are totally waterproof and can be left outside whatever the weather conditions for a prolonged period. This combines a pixel-mapping effect and a powerful LED wash. Each of the 9 cells is powered by a 9 watt RGB COB LED which gives extremely smooth, strong and vivid colours, which can be accessed through selectable multiple DMX profiles. Each unit is connectable on all four edges allowing the creation of larger panels for exciting pixel mapping effects. DMX pixel mapping software is required to get the best from these fixtures but inbuilt programming, colour wash and dimming can be accessed through the Transcension DMX controller below. Ideal for theatrical productions, concerts, dance floors and more, this is a punchy dual zone blinder with warm white 85W COB LEDs. It comes with inbuilt strobing and sound active programmes but can also be controlled via DMX (3 and 5pin connectors onboard). Adjustable pulse width modulation (PWM) control is on board to eliminate flicker on camera. Two fixture can be combined by an expansion bracket (available upon request) to create a 4-head blinder. This 100w fixture with a 33° beam angle produces a large wash of white light from high output, advanced COB (Chip On Board) cool white LEDs allowing for a powerful LED engine to be placed in a small amount of space. 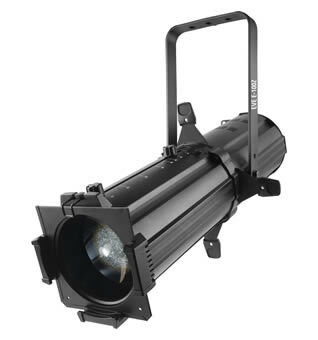 This professional lighting fixture is designed for washing performance stages, theatrical productions and special effects productions with excellent strobing capabilities. It has 5 selectable smooth dimming curves and is flicker free for TV use. It is fully controllable via DMX. These portable followspots are equipped with either a 75 watt white LED for small stages or a 120 watt white LED for small to medium stages that are more brightly lit. They both have hardedge, focused beams, which can be softened using the variable focus controls. Easy to set up and tear down, they are supplied with a tripod. As well as white the fixtures include a 7 colour wheel for instant colour changes, a strobe facility and manual iris and focussing. Smooth LED dimming makes professional fading simple, while a single gobo slot projects crisp patterns onto any surface. 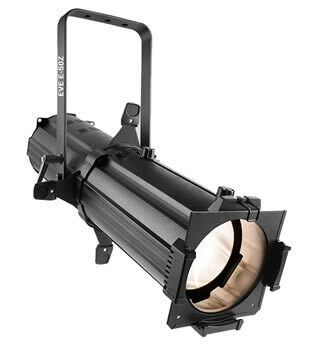 An LED ellipsoidal that shines a hard-edged, warm white spot designed for mobile applications. Manual zoom gives you the flexibility to project from any distance and its framing shutters let you easily alter and control the projected beam. It includes holders for glass and steel gobos as well as a gel frame. You can operate it in standalone mode or with DMX control. Zoomable from 25-50 degrees, with 575w lamp that outputs the equivalent to 1000w on many comparable fixtures due to it’s superior optics. 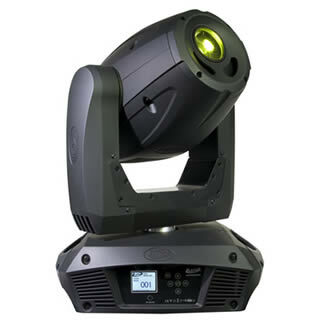 Great for application on the small stage or in clubs, retail events and industrials, the Source Four jr Zoom boasts rugged ETC fixture construction. Supplied with M sized gobo and gel holders. Please be aware that these lights get very hot and require suspension from some sort of lighting stand or bar. 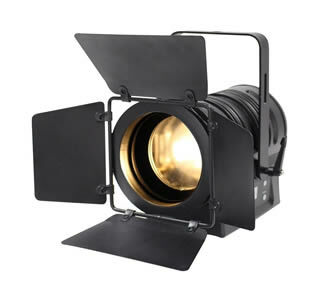 A compact, easy-to-use framing spot light powered by a 23-watt white LED. Utilizing a 16 to 24 degree zoom and internal framing shutters, you can easily size and mask light off unwanted surfaces with precision. A single gobo slot houses one of four included gobos, or a you can have your own version custom-made (See projection page). Nearly any color can be achieved with its removable gel frame. A bright 3W white LED pinspot with 12-degree beam angle contained in a compact case design. 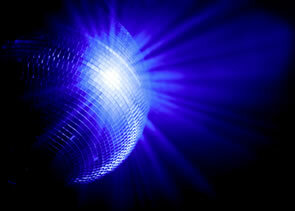 Ideal for illuminating a mirror ball or spotting a cake or product. Small, compact and lightweight fixture is a 10W White LED that produces a very impressive beam of light. DMX Control allows for dimming and strobing if required. Perfect for a variety of applications, from highlighting art and retail displays, to generating mood lighting, to projecting onto a rotating mirror ball. Supplied with both 9° and 13° beam angle lens. Perfect for lighting centerpieces, cakes, and focal points, its magnetic base affixes to most metal surfaces, eliminating the need for clamps, and the scissor clip with eye loop easily attaches to drop ceiling supports, for quick setup and cable management. Wireless on/off operation is available with the optional IRC-6 remote, and you can easily achieve multiple lighting looks with the included gel pack. Designed for use in restricted spaces. Ideal for colour washing a product, wedding cake or even a corner or architectural feature. It is a tiny fixture which you can control either with the dip switches on reverse or via DMX. 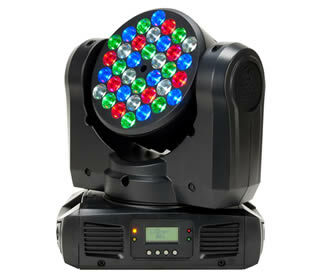 A mini Moving Head that creates beautiful washes of colour with its 28-degrees beam angle. Its compact size and lightweight makes it ideal for mobile entertainers, small club and bars, churches or any mobile production. 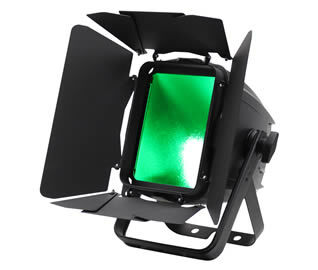 Featuring 4x 10W 4-in-1 Quad LEDs (RGBW - Red, Green, Blue and White), its fast moving head produces brilliant washes of colour. It is flicker free and has 5 user selectable dimming curves, ideal for TV or theatrical applications. Users may control the Inno Pocket Wash by the supplied wireless remote, or DMX. 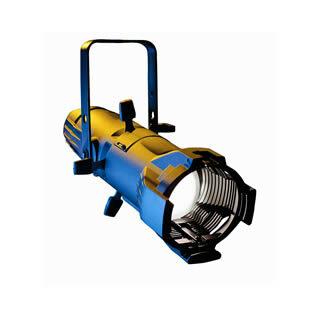 This high performance moving beam/wash fixture is ideal for band and stage lighting. 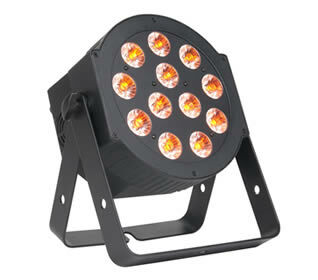 Powered by 36 x 3W RGBW Cree LEDS, it gives a tight beam creating effects seen on many popular TV shows. It is, however, compact and lightweight and therefore easily transportable. It has full DMX control but also will run in sound to light and master/slave modes and controlled by a CA8 so could be used at a disco. 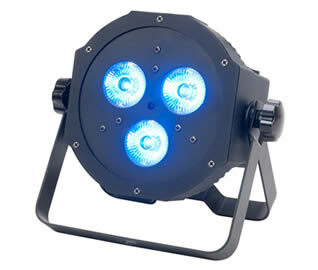 A light but remarkably effective, capable and bright LED moving head. 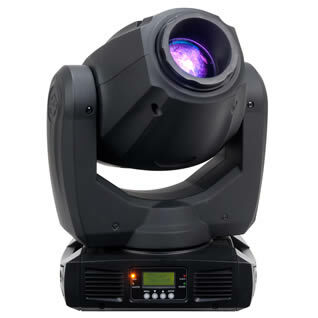 It has full 540° and 270° tilt along with separate colour and gobo wheels – 8 colours plus open and 6 rotating gobos plus spot – a 3 facet prism and electronic focus. Controllable via the Transcension DMX desk, it makes this an ideal stage lighting spot effect. A superb full featured moving head spot in a remarkably compact and lightweight package. This is made possible by using the revolutionary 5R lamp, which has a notional rating of 150w, but is closer in output to a 575w metal halide lamp. It features 22 gobos (8 rotating 14 static), 3 facet rotating prism, 8 dichroic colours, motorised focus, iris, frost filter, 17° beam angle, mechanical dimmer, shutter & strobe. It will operate in sound to light mode, but it requires a DMX desk to get the best from it. 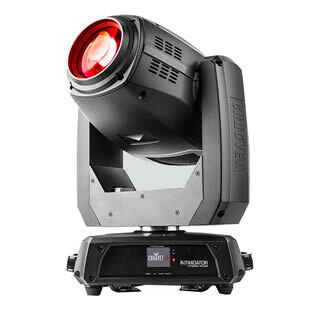 A powerful all-in-one moving head fixture that morphs from Spot to Beam to Wash effortlessly. 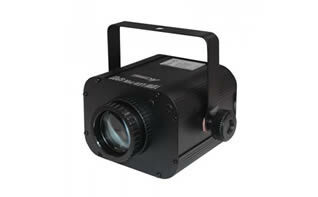 Fitted with an intense 140 W discharge light engine and motorized focus, it projects crisp beams and gobos at almost any distance. Two overlapping independently controlled prisms create dynamic beam effects. Dual gobo wheels allow for gobo morphing and amazing mid-air projections. 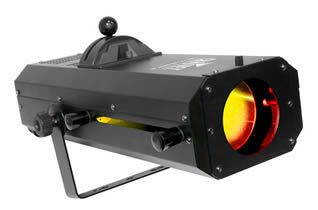 The motorized zoom works in beam, spot and wash modes for ultimate light control. Control is easy with the full-colour display, totem mode and on-board memory for storing a scene, as well as a comprehensive range of DMX personalities. An easy to use DMX based controller for 3 channel RGB fixtures which allows one touch colour selection buttons, the ability to spectrum mix any colour combination, dimming and chases. 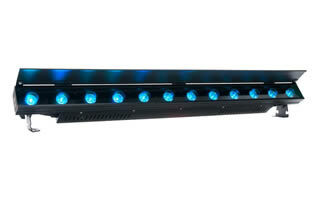 A more sophisticated LED wash controller for fixtures with 3 or 4 channels in RGB or RGBA/W. It allows full colour mixing and dimming for lights in up to 4 zones, each separately controllable. It has inbuilt fades, chases and sound to light control. The EasiLED 4 is a simple to use universal DMX controller designed for controlling multi-colour LED fixtures. Suitable for use with RGB or RGBW products, with or without dimmer channels the controller may be used for LED par cans, panels or even LED strip lights. Designed to operate four fixture groups, the controller has an intuitive layout with a rotary colour selector and dimmer fader for each of the four fixture groups. 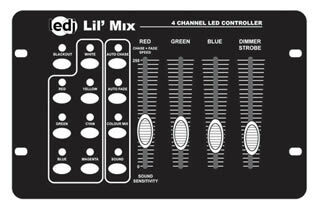 A 36-channel DMX controller that was specifically designed for ADJ HEX Series products, but perfect capable with any other LED fixtures that have am RGBWA+UV channel arrangement. Up to 6 fixture groups can independently be controlled. 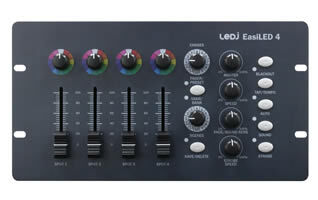 The control panel includes 24 direct access pre-programmed color macro buttons, 6 user programmable color preset buttons which come factory set to control Red, Green, Blue, White, Amber and UV, 6 multi-function channel faders which are used to control individual color intensity, Chase program “Speed”, Chase program “Fade”, Master Dimmer and Strobe speed. An ideal accompaniment to Ultra Hex Par 12 and Ultra Hex Bar 12 fixtures above. 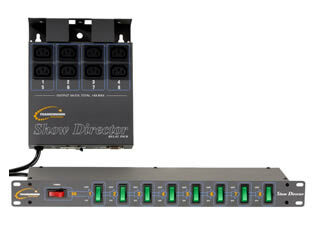 This is a fully featured DMX controller for up to 8 LED fixtures, each with 8 channels. It is fully programmable and each channel is re-assignable making it easy to control fixtures with different channel assignments . 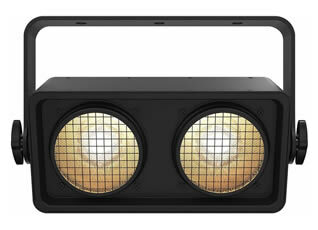 It has inbuilt chases and fades and sound to light capabilities. Programming can be saved to a USB stick. 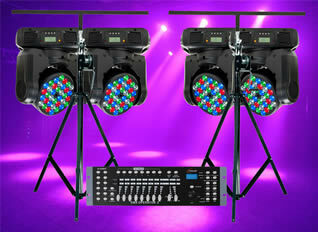 Full feature 16 channel DMX lighting and effect controller. 240 programmable scenes are available in 30 banks and 6 complete chase programs, the control unit has a speed control option and can also be set to audio synch operation. 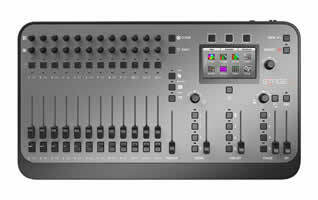 Full pan/tilt, black out, fade controls and 8 faders give maximum DMX capabilities. Suitable only for those with an understanding of DMX programming and control. 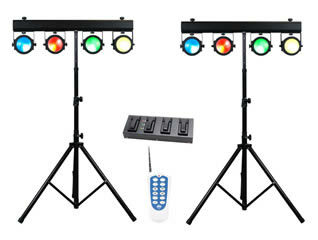 Targeted specifically at bands running their own lighting but want something a bit more sophisticated than just a simple colour change or the in-built sound to light programmes of basic fixtures, the Foot-C™ is a compact 36-channel DMX foot controller that can control up to 6 six-channel fixtures and storing 12 sets of chases with up to 24 steps each. 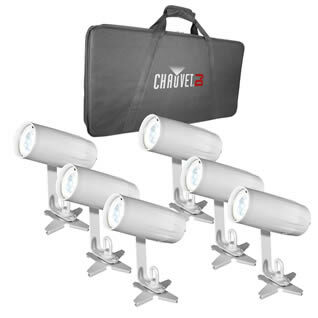 Ideal for 6-channel fixtures (commonly RGBA with a dimmer and strobe channel), it has a rugged guitar pedal-style buttons that can trigger auto and sound modes, as well as control chases and scenes. 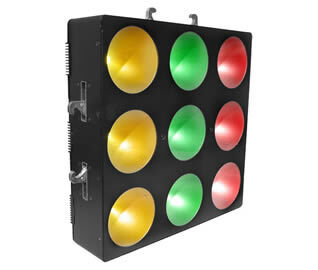 A LED display makes it easy to navigate the controller in any environment. Designed specifically for LED fixtures but just as suitable for conventional lights, the Stage CL gives you full control of your LEDs making it extremely powerful but also incredibly easy to use. Each of the twelve channels has a Saturation encoder and a Hue encoder that you can adjust to set the colour you want. As you turn the dials, an LED on the channel strip shows the colour you’re creating. There is also a touchscreen colour selector. This is so intuitive that even someone with no experience of lighting can grasp it immediately. As well as giving you total manual control, the Stage CL’s automation features enable you to create sophisticated shows quickly and easily, via saved looks, scenes, and chases. 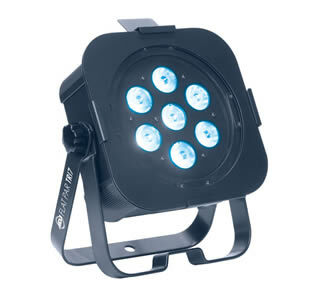 Suitable for band lighting, dramatic performance, event and conference work. N.B. This desk is only suitable for static LED fixtures, not moving lights nor disco style effects. For these you need a non-LED dedicated DMX desk such as the Transcension DMX Operator. The answer to the problem of cables in a multiple lighting unit setup. The system includes an 8 channel switch unit and a remote relay pack which enables the lighting operator to turn effects on and off at the simple flick of a switch from the lighting desk. from which to support these fixtures.